An 84 year-old female presents with low back pain, right leg pain, hip pain, numbness and weakness. STIR sagittal (1a) and T2-weighted axial (1b) MR images of the lumbar spine are provided. What are the findings? What is your diagnosis? (2a) The sagittal STIR image, demonstrates abnormalities at the L2-3 and L3-4 levels, with apposition of the spinous processes, subcortical cystic changes (arrowheads), and dorsal midline epidural cysts (arrows), which cause posterior compression of the thecal sac, abutment of the descending nerve roots of the cauda equina, and contribute to central canal stenosis at these levels. At the L2-3 level, there is interspinous bursitis (short arrow), which is in direct communication with the dorsal epidural cyst. Fibrosis is present within the dorsal epidural cysts, as well as posteriorly, along the supraspinous ligament. Mild anterolisthesis of L3 on L4 and L4 on L5 are present, related to degenerative disc disease and facet arthrosis (not shown). (2b) The axial FSE-weighted T2 image (with inset cross-reference sagittal STIR image) reveals a dorsal midline epidural cyst (arrow), with a neck extending into the midline cleft (arrowhead) between the thickened fibers of the ligamentum flavum. Dorsal midline intraspinal epidural cysts, associated with Baastrup’s Disease. Low back pain is extremely common, with a lifetime individual prevalence between 49% and 90%1,2,3,4,5, and it is a top 5 chief complaint in emergency departments in the United States and Canada.6,7 Back pain is often multifactorial, most commonly attributed to discogenic and facetogenic abnormalities. The interspinous region is an often overlooked cause of back pain. Baastrup’s disease, or kissing spinous processes, can cause pain, which is exacerbated with hyperextension or increased lordosis, and can rarely be associated with radiculopathy if there is an associated dorsal epidural cyst. In 1933, Danish radiologist Christian Ingerslev Baastrup described pathologic changes that occur in adjacent lumbar spinous processes and the soft tissues between them, which are associated with back pain.8 Although the popular eponym is attributed to Baastrup, fluid filled cavities between overgrown lumbar spinous processes were previously reported in soldiers, by Mayer in 1825, and he called it “diarthrosis interspinosae”.9 In 1929, Brailsford described the radiologic findings of interspinous arthritis in patients who had pain in extension, that was alleviated with flexion, and called it “kissing spines”.10 The terms Baastrup’s disease, kissing spines, and interspinous bursitis have been used interchangeably by many authors. The segments of the vertebral column are connected together by ligaments, which can be divided into five sets: those connecting the vertebral bodies, the laminae, the articular processes, the spinous processes, and the transverse processes. Each set can be subdivided, but for the purposes of this discussion we will concentrate on the ligaments of the laminae and spinous processes. The ligamenta subflava connect the laminae and extend from the axis to the sacrum. Each consists of two lateral portions, which start at the roots of the articular processes and extend dorsally to the region where the laminae converge to form the spinous process. At this point they contact each other and are somewhat united, but contain natural central clefts that allow the passage of small vessels. It is through these natural clefts that posterior epidural cysts can extend into the central canal, from interspinous bursitis. The ligaments of the spinous process are subdivided into the supraspinous and interspinous ligaments. The supraspinous ligament is a dense collagenous cord that attaches to the apices of each spinous process, starting at C7 and extending to the sacrum. It continues cephalad, from the C7 spinous process to the external occipital protuberance, as the ligamentum nuchae, where it is much thinner. The interspinous ligaments are thin membranous collagenous bands that extend from the root to the summit of each spinous process, interconnecting adjacent levels, extending ventrally to the ligamenta subflava, and dorsally to the supra-spinous ligament. The AP rendering of the lumbar spine with the vertebral bodies removed (left) demonstrates the normal ligamenta subflava (red) connecting the laminae. The normal supraspinous and interspinous ligaments (blue) are better seen on the lateral view of the spine (middle). The changes that can occur with Baastrup’s disease are illustrated on the right including close approximation of the spinous processes with bony hypertrophy and degenerative change, interspinal bursitis, and midline epidural cysts. Hyperlordosis, vertebral disc degeneration with narrowing, and spondylolisthesis are typically seen. Symptomatic Baastrup’s disease has been treated with oral analgesics, NSAID’s, steroids, localized injection and surgery. (4) Lateral lumbar spine radiograph of an 80 year old female patient, in attempted flexion, with a history of lumbar spondylosis illustrating enlargement of the L2 and L3 spinous processes (asterisks), with contact, subcortical sclerosis and flattening at the neoarticulation (arrowheads). Spinous process apposition with subcortical sclerosis is also present at L1-2 and L3-4 (short arrows). There is straightening of the normal lumbar lordosis in this erect patient imaged in flexion. Note is also made of multiple osteoporotic compression fractures, multi-level degenerative disc disease, facet arthrosis, and atherosclerotic calcification of a small abdominal aortic aneurysm. Computed Tomography (CT) images from a 69 year-old male patient with low back and right lower extremity pain for 15 years. (5a) Sagittal reconstructed CT image shows apposition of the L3-4 spinous processes, with subcortical sclerosis (arrow) and a small osteophyte (arrowhead). (5b) Axial CT image in the same patient demonstrates nodular enlargement of the spinous process (arrowheads). (5c) Coronal reconstructed CT image illustrates apposition and flattening of the L3-4 and L4-5 spinous processes (arrows), with tiny subcortical cysts and sclerosis at L4-5 (arrowheads). 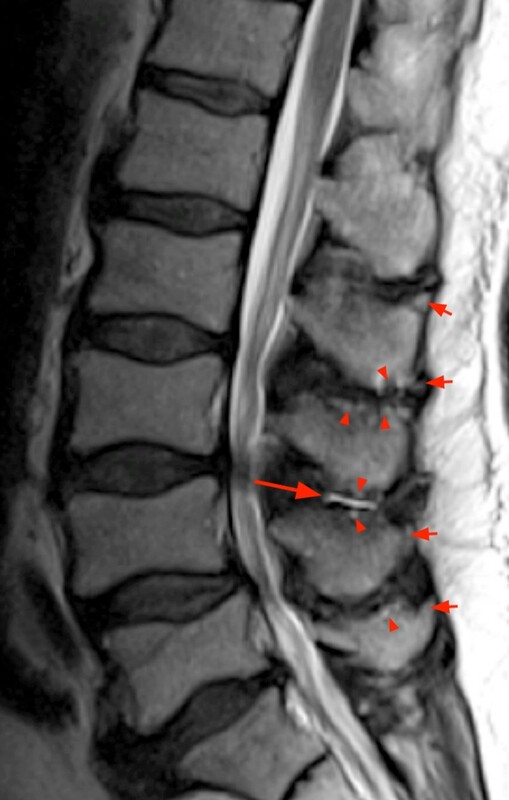 A sagittal T2-weighted MR image in a 75 year-old male with chronic low back pain demonstrates interspinous bursitis (arrow) at L3-4, apposition of the L2-5 spinous processes with small spurs (short arrows), subcortical cysts (arrowheads) and sclerosis, in a patient with congenitally short pedicles and degenerative disc disease that contribute to multi-level central canal stenosis. Sagittal T2-weighted MR image in an 81 year-old female with low back pain radiating into the hips and legs, demonstrates large subcortical cysts in the L3-4 spinous processes (arrowheads). There is severe L2-3 spinal stenosis related to a central disc extrusion (arrow) and severe thickening of the ligamentum flavum (asterisk). Sagittal STIR MR image in a 69 year-old male with low back pain radiating into bilateral buttocks with numbness and tingling, shows interspinous bursitis (arrow), with subcortical cysts (arrowheads) and edema (asterisks). There is also multi-level spondylolisthesis related to multi-level degenerative disc disease, small extrusions, and facet arthrosis (not shown) with multi-level central canal stenosis. Back pain is excessively prevalent, often multifactorial in nature, but most frequently discogenic or facetogenic in origin. The interspinous region is an often overlooked cause of back pain. Baastrup’s disease, or kissing spinous processes can cause pain, which is exacerbated with hyperextension or increased lordosis, and can rarely be associated with radiculopathy if there is an associated dorsal epidural cyst. Radiologic findings of Baastrup’s disease include apposition of spinous processes, subcortical cysts, subcortical sclerosis, subcortical edema, osteophytes, interspinous bursitis, and occasionally epidural cysts. Baastrup’s disease is also associated with loss of intervertebral disc height, disc bulges, facet arthrosis, spondylolisthesis, spondylosis and central canal stenosis. Symptoms of Baastrup’s disease are often indistinguishable from other causes of back pain. MRI is an excellent tool in the evaluation of patients with back pain with or without radiculopathy, and provides a valuable roadmap in treatment planning.